Recently, Leesfield Scolaro represented the family of a young child who was fatally injured while snorkeling by the propellers of a boat off of Cow Key Channel, in Key West, Florida. Last weekend, a very similar incident took place, this time near Edward B. Knight Pier, formerly named White Street Pier. While boating accidents involving swimmers / divers are statistically down, it remains one of the top 3 concerns in Florida according to the latest boating accident statistics released by the Florida Fish and Wildlife Conservation Commission (“FWC”). In this latest tragedy, 29 year old David Corlew was spearfishing approximately 200 yards off the pier with fellow spearfisherman. At around 8:30 a.m., a a twin-engine 32-foot commercial charter Sea Vee vessel operated by Robert Householder struck David Corlew, who was displaying a diver-down flag as required by Florida Law, which caused him to sustain traumatic leg injuries. While the investigation into this particular event is still ongoing, and as of two days ago no charges had been files against Householder, it is important for the general public to be reminded that the purpose of the “diver down flag” is to notify to boaters in the area to steer clear for the safety of the diver and to avert the possibility of a collision. 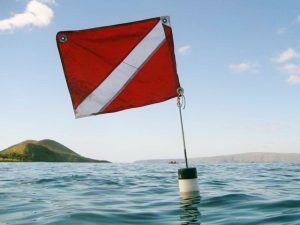 When an experienced and attentive boater sees a diver-down flag, they immediately assure that their vessel does not come within a short distance of the flag where they know a diver is swimming below the surface. In the wrongful death case Leesfield Scolaro handled, the young child, was snorkeling with his brother and father. The small group of three also had a flag to notify to everyone else, especially boaters, that snorkelers were present in the area and to avoid the area or proceed with caution. While displaying their flag did not prevent this terrible accident, it must serve as a reminder that operating a boat requires the operator’s undivided attention and imposes that under no circumstances a diver down flag should be ignored, for the consequences are usually catastrophic. David Corlew, a husband and father of two, is said to have endured a seven-hour surgery at Ryder Trauma Center in Miami, with several additional surgeries in his future.